Cesar Trevino, PharmD, Pharmacist-in-Charge - Stonegate Pharmacy: Dedicated to You. Cesar Trevino, Pharm.D., B.S. graduated from the University of the Incarnate Word Feik School of Pharmacy in May of 2013 with his Doctor of Pharmacy. He was honored as only the 3rd graduate ever to receive the FSOP Dean’s Pinnacle Award. He was born in Laredo, TX and was raised in Zapata, TX. He came to San Antonio in 2002 to attend University of Texas San Antonio where he graduated with his Bachelors of Science with a major in Biology. 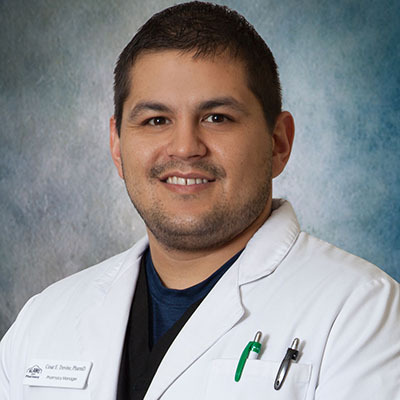 Cesar is fluent in both English and Spanish, and holds a certificate of Pharmacy Education in Spanish from UIW FSOP. He is also an APhA certified immunizer and has experience with vaccinations ranging from the influenza vaccine to the varicella zoster vaccine.